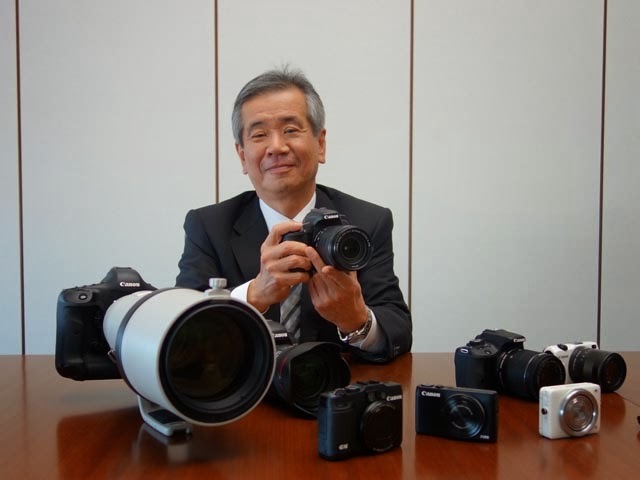 Mr. Masaya Maeda of Canon Inc.
DPReview interviewed senior executives at Canon Inc. on two occasions, in Japan. The first meeting was held in late 2013 at Canon's headquarters in Tokyo, and a follow-up interview was arranged at the recent CP+ Show in Yokohama. I have been a wildlife photographer using Canon equipment for 25 years and an observer of the company for some time. Last year, I have made some comments and suggestions for my friends in Tokyo. The interviewer missed an opportunity to ask some tough questions like, why is Canon introducing their newest technology on their low end products first and why are they blurring the line between professional and semi-professional equipment? Executive Vice President and General Manager, Imaging Technologies & Communications Group, Canon U.S.A.
Senior General Manager, ICP Development Center 1, Image Communication Products Operations, Canon Inc.
From an outsider's perspective, Canon might appear to be innovating more in the video sphere, with Cinema EOS, and maybe a little less in your stills cameras. Is this fair? [MM] It's certainly not true. We place a high importance on innovation in still photography. If you look at our EOS system, the recent 70D offers a Dual Pixel AF sensor and we're also introducing new and different EF lenses all the time. I think that both are equally important for us - stills and video. [YI] In the past, you might place movies in one space, and still pictures in another space but in the future that distinction will disappear. A single device can do both. That's how we see the relationship between stills and video, conceptually. Up to now, we've been known by consumers as leaders in still photography, but maybe not in movies. With Cinema EOS this has changed, which might lead to a perception that we're pushing video more. But actually we're pushing both very hard to make total imaging devices. Are smartphones a threat to Canon, or an opportunity? [MM] We don't see the smartphone as an enemy. We like to see it as representing an infrastructure which we should be making use of. If we make sure that we continue to produce cameras that do things which smartphones can't, and we also continue to provide links between our cameras and smartphones we'll be able to create a system which is of benefit to our customers. [KS] Obviously smartphones have taken some of the compact camera market away, but there are certain domains in which the smartphone cannot compete. For example applications that require zoom. Even compact cameras aren't beaten by smartphones in some respects. When it comes to DSLRs versus smartphones, they don't compare. Because of the difference in image size, versatility and the ability to change lenses among other things, the DSLR exists in a different domain. What is emerging as a result of the increasing use of smartphones is a change in photographic culture. You can use a smartphone as a tool for sharing your pictures with other people over the internet and that is one respect in which we want our DSLRs to 'cohabit' with smartphones. You and I both know that cameras take better pictures than smartphones, but how will you get that message to consumers who have become photographers thanks to their smartphones? [MM] Realistically, thanks to the global prevalence of smartphones there are more photographs being taken. And as such I anticipate an organic growth of people who are using their smartphone and come to want to take better photographs. Regardless of what device they're using, whether it's a smartphone or a compact camera or DSLR, I'd like to encourage people to take more and more pictures. [GT] The products have to be strong, and attractive, and innovative. We have to offer something that is completely different from existing options, and make products that are more attractive otherwise we won't be able to sell them. The era when we could make cameras and just assume that they'd sell is over. Our objective is to make shooting images more appealing to our users. Through our marketing activities we need to draw attention to that aspect, to make our users more aware of the ways in which they might enjoy using DSLRs. [YI] We want to show people how fun it is to be creative in both stills and movies. it's our responsibility to educate our end users and we invest a lot of energy in speaking to them. [GT] Despite the fact that these are hard times for the camera market, nothing has really changed in our approach. The pressure is on for us to distinguish our DSLRs from smartphones and compacts so if anything we're putting more effort behind our research and development. We're number one in the camera industry and we're the leading DSLR manufacturer. As such we want to fulfill our responsibility. However we're not going to be happy if just Canon grows, we want to contribute to the DSLR segment by having the whole segment grow as well. When do you think we will see a truly affordable full-frame DSLR? [KS] We can't reveal plans for our future product development, but as you know we released the EOS 6D in 2012, which is designed for the mass market. Advanced amateurs are now able to choose from two full-frame options - the 6D and the 5D Mark III and at the top end we have the EOS-1D X, for professional photographers. The question of whether we'll see a wider range of users expressing an interest in purchasing full-frame DSLRs is one that we're monitoring through feedback. And of course, this information will be incorporated into our product planning. Some of our readers regard Canon as rather conservative - maybe a little boring compared to other manufacturers. Can you comment on that perception? [KS] They may perceive us in that way, but we are incorporating technological innovation into our products. The EOS 70D's Dual Pixel AF technology is a good example of innovation that is unique to Canon. Dual Pixel CMOS AF was born out of the concept of allowing the user to freely choose which kind of finder they wanted to use. The optical finder, the camera's LCD or the screen of a mobile device via our EOS Remote app. What is the main feedback you get from your EOS users? [KS] We've found that feedback from users is different depending on the country that they're from. For example, among customers in the USA the need for videos is rising. They're asking for the highest picture quality both in stills and video and they're asking for the two to be merged. Consumer digital imaging is now roughly ten years old, measuring from the EOS 300D / Digital Rebel, which was the first sub-$1000 DSLR. What is driving the evolution of your stills cameras? [KS] Up to now, digital cameras have been following film cameras, in the sense that the goal was to catch up with the quality of film. I think we've reached that point now, so going forward, the voyage will be undertaken without a chart to guide us. It's difficult therefore to imagine what we might do next. One of our missions though is to expand the domain of image taking. Connectivity is important, as well as the convergence of stills and video but looking to the future one thing I can say for sure is that the camera has to outperform the human eye. There are many development tasks around that goal, such as increasing resolution, sensitivity, dynamic range and so on. Ultimately what we want is to have a camera that incorporates all of this. With unlimited resolution, unlimited sensitivity and unlimited dynamic range you can take photos of anything that exists on this earth. That's our ultimate goal. In consumer photography, it seems like every decade or so a new technology or feature comes along which shakes up the market. After digital imaging, what's the next big thing? [MM] For a long time people having been talking about stills and movies coming together as a single, fused function and maybe in the 4K era we will see stills and movies integrated into one. This fusing might become the driving force for the next revolution. Will still photography be necessary in the age of 4K video? [MM] Yes, definitely. There will always be a need for still photographs, in my opinion. I believe that still images contain more information, and have more depth and meaning. [GT] Somewhere in the future, maybe the two things might converge but currently with 4K technology you're talking about an 8MP still image, and with 20-30MP stills cameras being the norm I don't know whether 8MP would satisfy someone's needs. There's still more work to be done, but somewhere down the line, it might converge. Looking ahead a few years, what do you think the future is for photojournalists? [GT] We've made great strides in improving the image quality of our DSLRs' still images, but now we're seeing an increased focus on video capture, so we need to respond to that need. What are your professional lens users asking for? [NK] Well it depends on the discipline but for sports, the kinds of things our professional users ask us for are durability, image quality and weight. So last year we made efforts to reduce the weight of the telephoto lenses that we offer our professional customers. For wildlife and landscape photographers they also ask for lighter lenses, but they're also asking for higher resolving power. Professional users have a wide range of different areas of specialty, so we have a wide range of requests. How does the requirement for video influence lens design? [NK] In terms of EF lenses, we've needed to make certain changes, for example there was a requirement for autofocus to operate more quietly. We also need the lens apertures to operate more smoothly for video shooting and minimize lens breathing if focus is changed during filming. For entry-level EOS cameras we created a new range of consumer-focused lenses like the 18-135mm STM which are focused on the needs of people shooting video and we'll continue in that direction. How important is video to your non-professional users? People are taking more movies with still cameras. We've confirmed this trend. There are also more opportunities now to display and share movies than ever before, which puts shooting video closer to our users' hearts. For this reason video is an important feature even on entry-level cameras, and one that people are looking for. The EOS M was a somewhat conservative entry into the mirrorless market - was it a failed experiment? [KS] Well it was certainly an experiment! Japan and Asia as a whole accept mirrorless cameras more than any other markets. In the US, in terms of total number of cameras sold, mirrorless cameras account for less than 20%. So with the EOS M, with Japan as our main market we were able to secure good market share. We will continue to produce new mirrorless cameras and although our competitors in this field are very strong, we hope we won't be beaten by them. Will the EOS M2 come to American and Europe, or will it remain a Japan-only product? [GT] It's a possibility but we haven't made a final decision yet. We're looking at the market. Mirrorless cameras' contrast-detection AF systems offer more accurate autofocus than DSLRs. How are you addressing that challenge as you evolve your DSLRs? [GT] There are various technical issues before us and while I can't give you specifics we have various approaches that we're working on and are planning to introduce. Is it easier to design lenses for mirrorless cameras, or for DSLRs? [NK] In designing lenses for mirrorless cameras we have a degree of freedom, in that they don't need to have a long flange back distance. Especially when making high-quality wide zoom lenses, it's easier to design them for a mirrorless platform. A good example of this is the 11-22mm zoom for the EOS M. Its optical performance is very high. Presumably in some respects it's also easier to make cameras without mirrors in them than it is to make DSLRs. Why has Canon not seriously invested in mirrorless technology yet? [GT] We are very serious about mirrorless cameras, but we're also very serious about our DSLRs. We believe that there's a lot of value in DSLRs from the customers' point of view and we expect DSLRs to evolve a lot. The current trend is for equipment to become smaller and more compact and we will continue to build mirrorless cameras as well as DSLRs. [YI] We and our competitors market both types of camera, but mirrorless is only a small part of the market in the USA. American consumers seem to place priority on the superior speed and ability to capture the moment with DSLRs. DSLRs can capture the moment better than mirrorless, because you're viewing directly, not through an LCD. Americans also seem to prefer bigger cameras. Sales for the Rebel SL1 have not been as great as we expected in America, for example. We've received some complaints about it being too small. But in Japan and Asia we don't see any complaints about that. So we have to be mindful of the differences between regions. When you look at the future for photography, is there anything that worries you? [MM] Not specifically. Maybe if someone invents a potion for eternal life, that will be the day that people will stop wanting to record events. But as long as our lives are limited, I believe that people will continue to want to capture memories.